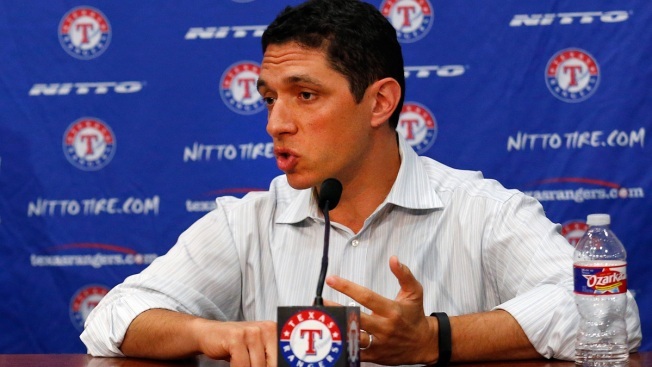 Jon Daniels, Texas Rangers President of Baseball Operations and General Manager, talk with the media at Globe Life Park on April 27, 2015 in Arlington, Texas. Gone are the Rangers’ long Winter days lamenting a dwindling payroll at the hands of Tom Hicks. That’s enough in itself to give us a Happy New Year. With the Rangers having already made their big offseason moves, it appears their payroll – along with expectations – will get a bump in 2016. I never understood how a (relatively) successful pro sports team in a Top 5 media market was subjected to a payroll in the bottom third of its league. With Hicks’ departure and the deep pockets and high hopes of Ray Davis and Bob Simpson, we no longer have those concerns. Barring unexpected, major roster upheaval, looks like the Rangers will again this season have a Top 8 payroll. Last year their salaries added up to around $135 million; this year approximately $145 million. And if general manager Jon Daniels hadn’t pulled off some shrewd maneuvers it’d be much higher. Just think, in 2016 the Rangers will benefit financially from having other teams pay for their players. As in, the Tigers will pay $6 million of Prince Fielder’s salary, the Phillies $3 million for Cole Hamels and the silly Angels are on the hook for every penny of Josh Hamilton’s deal to the tune of $26 million.